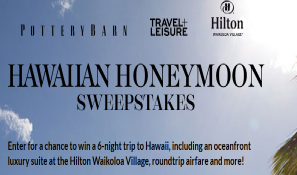 Pottery Barn Hawaiian Honeymoon Sweepstakes – Win a trip to Hawaii! 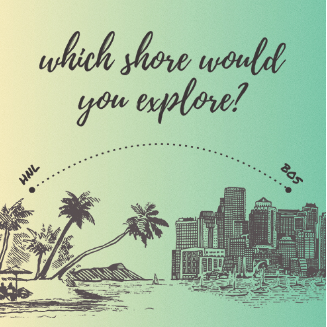 Win a trip for two to The Big Island, Hawaii! ENTER SWEEPSTAKES HERE – Pottery Barn Sweepstakes page. You will need to create a Pottery Barn Registry before you are eligible to enter this sweepstakes (it does not have to be a wedding, just an event – wedding, anniversary, birthday, etc.). ENTRY LIMIT – Limit: Each participant may enter one (1) time per day during the Promotion Period. ELIGIBILITY – Hawaiian Honeymoon Sweepstakes is open only to legal residents of the fifty (50) United States (and the District of Columbia) and Canada (excluding Quebec), who are at least eighteen (18) years old at the time of entry and who have a registry on http://www.potterybarn.com/registry or at a Pottery Barn store with an event date on or after January 16, 2015. SWEEPSTAKES PERIOD – The Sweepstakes begins on January 16, 2015 at 12:00 a.m. United States Eastern Time (“ET”) and ends on March 8, 2015 at 11:59 p.m. ET. to departure. Travel and accommodations are subject to availability and blackout dates. Travel must be round trip. Sponsor will determine airline and flight itinerary in its sole discretion. No refund or compensation will be made in the event of the cancellation or delay of any flight. Approximate Retail Value (“ARV”): $5,000 USD.